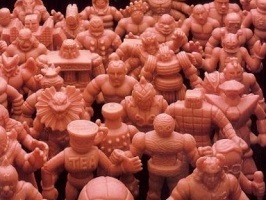 « How Much Are M.U.S.C.L.E.’s Worth? M.U.S.C.L.E. can appear to be a simple toy to categorize and organize. There are a finite number of basic figures and only a few accessories. This apparent simplicity seems to be an irresistible siren call to over enthusiastic toy collectors. 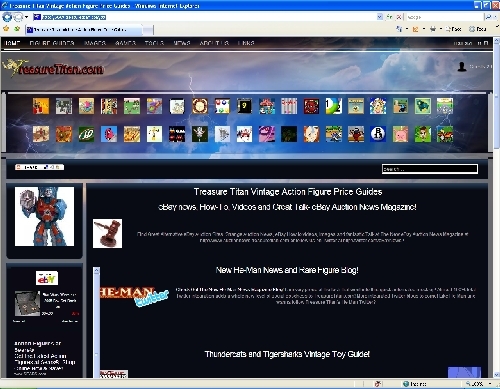 TreasureTitan.com has very little focus and attempts to be something for everyone with the spotlight pointed at various toys, video games to play, and several other widgets. The site was initially discovered through this link, but the home page is actually TreasureTitan.com. There is no identifiable date for any section. The “guide” attempts to constantly update. There is very little content. The M.U.S.C.L.E. coverage is broken into two main sections: (1) an image gallery; and (2) a figure guide. This section suffers from poor numbering. Figure #1 is followed by all of the tens. Figure #2 is followed by all of the twenties. This renders the section annoyingly cumbersome. This section includes Satan Cross, but fails to highlight the two ring figures. These two figures are very commonly considered to be part of a full Flesh set. 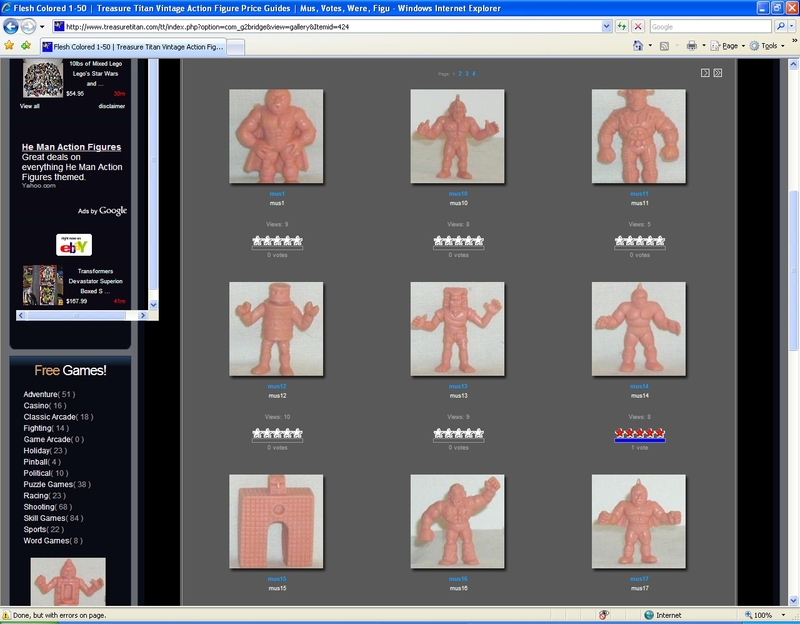 The picture is of 10 random color figures, although one looks to be a badly faded Flesh or bootleg figure. There is a Romando figure, several flesh lots, another Flesh kinkeshi line, and lazily constructed pictures of figures interacting. The Random Flesh seems to simply be a collection of random M.U.S.C.L.E.-related pictures. The text for each of the seven sections is directly copied from Wikipedia’s M.U.S.C.L.E. entry. Each section seems to receive a different paragraph from Wikipedia, although some sections repeat or combine paragraphs. “Figure guide” is a completely inappropriate title for the section. The guide is simply a page of eBay searches. The layout and look of the page is reminiscent of an early 90’s webpage – it is cluttered and confusing. Most of the eBay search widgets appear disabled or not to work at all. The color wheel graphic is stolen direct from Nathan’s MUSCLE Page. At the top right of the page is a grid suggesting different subsections (e.g., “Rare MUSCLE”, “Red Kinkeshi”, etc.). Clicking these links simply offers more inoperable eBay widgets. The entire website is riddled with design problems. The menus at the top of the screen are intuitive, but with so many links falling over other links and can be difficult to navigate. Trying to use the drop-down menu to look at the image gallery had me clicking on the video game links that clog the top of the pages. There are pictures of 234 M.U.S.C.L.E. figures, but they are of acceptable to very poor quality. This is one of the worst websites on the internet. It was cluttered, difficult to navigate, and generally a mess. Even when a user navigates to the desired location the information is copied from another website or not what it is purported to be. This website offers nothing helpful to anyone interested in M.U.S.C.L.E. This entry was posted on Thursday, July 2nd, 2009 and is filed under UofM News. You can follow any responses to this entry through RSS 2.0. You can skip to the end and leave a response. Pinging is currently not allowed.